THE WRITING BUDDHA - Opinions | Books | Movies: Ancient Chants for modern living by Aatmanika Ram (Book Review- 4*/5) !!! 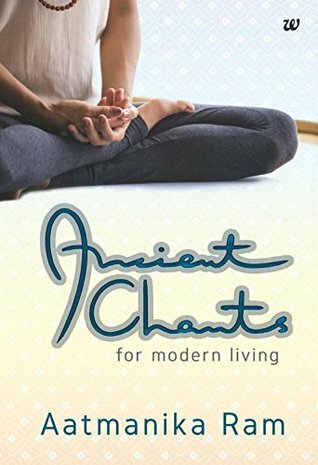 Ancient Chants for modern living by Aatmanika Ram (Book Review- 4*/5) !!! On the occasion of Eid and a National Holiday, I picked up a book named "Ancient Chants for modern living" written by Aatmanika Ram and published by Westland publication. I have always found the books fascinating which links the old saying and formulas with the contemporary scenarios and world. This is one such book which is asking us to recite shlokas whenever we find ourselves in trouble or we are wanting to protect ourselves from unwanted troubles in life. Author believes that a human being faces both- mental and physical adversities throughout his life because of which he goes off track. To maintain his decorum in such situations, author have shared shlokas for each of them specifically to be recited in those circumstances. Author have not only shared the shlokas with us but also translated it in English and made us familiar with what it means to say. Not only this, for a specific problem, author have also suggested which temple to visit so that we can come closer to the God concerned with the issue. A very rare case but here, the author have also let us know why Hinduism discusses several Gods while other religions believe in only one. The another great thing in all the chapters are the examples that the author have given. It makes it easy for the reader to understand what kind of circumstances arise in different phases of life. I have also liked something which not many authors discuss in such self-help or spiritual books but Aatmanika have done it time and again- Making the reader realize the importance of financial and monetary power. She has made it quite evident in her writing that for a peaceful life the foremost approach for any human being should be of saving money as much as possible because 75% of issues in life can be solved just by it. Kudos to the authoress for pointing this out so clearly. In the end of the book, authoress have mentioned all the shlokas mentioned in the book under the issues for which they must be recited. I found this book quite different and interesting. It is a must read and something to have with you as these shlokas might change our life even if we may not believe in its power. I give this book 4.25* out of 5.